1934. Hercule Poirot, the famous detective (how was that a thing? Do you even know a single detective’s name in real life?) just wrapped up a case in what is now Syria. He hopes to travel back to his adopted home in the United Kingdom starting with a train ride on the legendary Orient Express. But instead of relaxing on the luxurious journey, fate has other plans in mind for Poirot. Two nights after departing from Constantinople, a man in the next compartment is murdered. Worried about their reputation, the train company calls on Poirot to investigate and have everything neatly wrapped up before the local authorities arrive. With the train trapped by a snowdrift, Poirot knows the murderer is still on board. Given that Murder on the Orient Express is built around an intricate puzzle of a mystery, it’s no surprise that any adaptation needs to be faithful to the novel in its mechanics. The main points of divergence were in the tone and theme. Puzzle solving is at the heart of every Poirot mystery and is key to the appeal of Christie’s work after all these years. What the makers of the adaptation chose to do in order to make it stand out was to place a conflict over Poirot’s moral code at its core. Christie used fairly obvious emotional manipulation to steer the reader in favour of the mob-like vigilante justice that motivates the crime. The TV adaptation takes a more nuanced approach. It sets up the conflict between justice and its human costs by portraying, early on, the deadly consequences of Poirot’s prior investigation and also a scene of a public stoning. On TV, the victim of the aforementioned vigilante justice is portrayed with more humanity: he prays and understands that he has committed grave sins. His murder is more horrific than what is described in the novel. 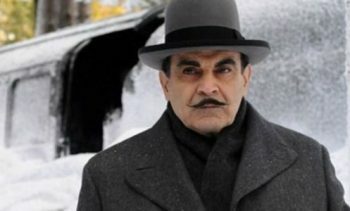 Poirot’s Catholicism, not an important element in Christie’s writing, is highlighted and continues a trend established in the TV series to add depth to his character. I didn’t even mention the cast. Though it can’t compete with the star power of either the 1974 version or the one coming out now, it still boasts Jessica Chastain, Hugh Bonneville, Barbara Hershey and Toby Jones among its guest stars. The atmospheric build-up to the murder is handled well. You know it’s coming but still feel the tension. The 2010 adaptation makes full use of the characterization established by the 60-odd episodes that have come before it. Because viewers are already familiar with Poirot’s intellectual process and behavioural quirks, these can be pushed to the background for a deeper study of his character. This is not something that could be pulled off by a standalone movie. Poirot’s moral conflict becomes especially poignant when it takes centre stage in his final mystery, and final TV adaptation, Curtain. If you’re looking to get into the David Suchet series, Murder on the Orient Express isn’t a good entry point. However, it is a commendable adaptation of a classic novel and is worth checking out on its own to see how it differs from the new movie.